The EWA and ALC have provided both a video and a white paper showing how the fraud was committed. The ten minute video, How the GAO deceived Congress about horse slaughter, was released on YouTube, and shows step by step how the GAO hid information in its possession showing abuse and neglect was in decline and misrepresented the data as showing it was increasing. The EWA found data from six states: Oregon, Idaho, Illinois, Maine, Georgia and Colorado. The records showed that abuse and neglect had been in decline between 2008 and 2010 (the last year of the GAO study), and that the GAO had used the wrong dates on the Colorado data to make it appear abuse had increased 60%. “Not only did the GAO misrepresent the data, they completely missed the importance of hay prices and availability,” said Holland. The EWA filed a FOIA request for the data used by the GAO and the request was denied. The EWA also filed an IG complaint, and finally had a conference call with the GAO to request the report be withdrawn. The GAO refused any response except to say that their reports were flawlessly cross checked. The Equine Welfare Alliance is a dues-free 501c4, umbrella organization with over 250 member organizations and over 1,000 individual members worldwide in 18 countries. The organization focuses its efforts on the welfare of all equines and the preservation of wild equids. November 2, 2011 – Chicago (EWA) – During his 2008 campaign, President Obama promised his unequivocal support for a ban on horse slaughter. “Now is the time for you to keep that promise, Mr. President,” says John Holland, president of Equine Welfare Alliance. Calling it “paramount to public health”, the Equine Welfare Alliance (EWA) and Animal Law Coalition sent a letter to President Obama, urging him to support a ban on equine slaughter for human consumption. The groups also presented the president with more than 6,000 signatures on a White House petition calling for an end to equine slaughter for human consumption. At the time the petition was created, the White House indicated the administration would consider any issue with at least 5,000 signatures. The equine slaughter ban petition easily gathered more signatures, more quickly than a petition created to reinstate equine slaughter for human consumption in the U.S. The opposition petition was lacking 2,750 signatures when the petition to ban horse slaughter reached 5,000. September 7, 2011 – Chicago (EWA) – The long awaited Government Accountability Office (GAO) report on horse welfare fell far short of the respectable reporting we have come to expect from the GAO, even raising questions as to the agency’s credibility. The Equine Welfare Alliance (EWA) and Animal Law Coalition (ALC) have issued an exhaustive analysis and executive summary, demonstrating the embarrassing and shocking lack of evidence for GAO’s findings. The analysis concludes that the GAO report is “disturbing” as it is filled with speculation, anecdotes, hearsay and unsupported opinions. The GAO sources appear to be largely known slaughter proponents. “The GAO’s pro-slaughter bias is clearly evident in the report’s defamatory accusation that the Cavel fire in 2002 was started by so-called anti-slaughter arsonists,” states co-author and EWA vice president, Vicki Tobin. The cause of the fire was never determined and it was Cavel’s owners who benefitted from the fire, claiming $5M when the damages were estimated at $2M. The EWA/ALC analysis details how, instead of doing the hard work of gathering actual data, the GAO relied on chitchats with a handful of state veterinarians with a few livestock board and other state officials and on information provided by pro-slaughter organizations. Chicago (EWA) – A coalition of animal welfare groups including the Equine Welfare Alliance (EWA) and the Animal Law Coalition has announced the first International Equine Conference (IEC) to be held September 26-28 at the Marriott Residence Inn, Old Town Alexandria, Va. The three day event will feature renowned experts on the welfare and preservation of both domestic and wild equines, legislators and medical experts. Presentations will address many aspects of the field ranging from horse slaughter to wild equine preservation and will include related human and animal health concerns. Among the many distinguished speakers will be Madeleine Pickens of Saving America’s Mustangs, Senator Mary Landrieu, Congressman Jim Moran, State Senator Dave Wanzenried, Paula Bacon the former mayor of Kaufman, TX, Ann Marini, Ph.D., M.D., Ginger Kathrens of The Cloud Foundation, Michael Blowen of Old Friends Thoroughbred Retirement Facility, Keith Dane with The Humane Society of the U.S., Lonita Stewart with Canadian Horse Defence Coalition, Katie Fite with Western Watersheds Project and authors Deanne Stillman and Alex Brown. A complete list of the presenters can be viewed at http://www.equinewelfarealliance.org/Int_l_Equine_Conference.html. The simple marketing rule of “know your audience” has eluded UOH which offers it “tools” to the horse industry that overwhelming opposes horse slaughter. A recent poll on Popvox, a barometer for Congress to assess support on legislation, indicates 76% support the legislation (S 1176) to ban horse slaughter. One of the most egregious of Wallis’ “communication tools” is the total disregard of FDA and European Union food safety regulations. Wallis has actually written her own regulations on Phenylbutazone (bute), a medication routinely given to U.S. horses that is banned in horses intended for food. She doesn’t think it’s a problem for people to eat horsemeat that contains a known carcinogenic and which can cause other deadly diseases. The “science and common sense” has already been determined and it is up to Wallis to follow the law, not rewrite it. Food safety laws aren’t “hysterical anti-slaughter claims”. Wallis’ refusal to follow food safety laws by creating her own rules should be a red flag to Congress about the misinformation offered to support horse slaughter. Chicago (EWA) – The Equine Welfare Alliance and Animal Law Coalition applaud Rep. Jim Moran and House of Representatives Appropriations Committee members who stood up for the horses this week. Rep. Moran introduced an amendment to the proposed agriculture appropriations bill to make sure commercial horse slaughter in the U.S. remains illegal. The amendment was accepted by the Committee on a vote of 24 to 21 and it’s now on to a vote by the full House on the agriculture appropriations bill on June 15. December 19, 2010 – CHICAGO – Wyoming resident Patricia Fazio, Ph.D. has filed a complaint with state officials, requesting an investigation of alleged violations of ethics laws and securities fraud by Wyoming State Rep. Sue Wallis (R-Campbell). Animal Law Coalition (ALC), Equine Welfare Alliance (EWA) and Habitat for Horses Advisory Council (HfHAC) applaud Dr. Fazio and join in the call for authorities to investigate Wallis’ activities. The complaint alleges Rep. Wallis is improperly and even fraudulently abusing her position as a Wyoming legislator. The complaint further alleges that Rep. Wallis not only neglected to recuse herself or disclose her personal financial interest in votes, but that she has actually “sponsored” bills that would materially benefit her or her family. Wallis has publicly claimed to be forming a business under the name Unified Equine LLC, which she says will slaughter horses and sell the meat within Wyoming. At the same time, in her capacity as a legislator, she is promoting legislation that would deregulate, promote and favor horse slaughter operations. July 7, 2010 – CHICAGO (EWA) – On June 23, 2010, the Bureau of Land Management (BLM) Elko District office buried on its website a notice that approximately 175 “abandoned, domestic, estray” horses located within Pilot Valley, NV, were scheduled for impoundment beginning June 25. The round up was expected to take 3 – 4 days with corrals set up on nearby private land owned by Simplot Land and Livestock until the horses could be transported and placed under the jurisdiction of the State of Nevada. According to Nevada laws, an estray is a horse that is found running loose on public lands but shows signs of domestication and the owner is unknown. A horse is considered “feral” under Nevada law if the animal was domesticated or is the offspring of domesticated horses and has become wild with no physical signs of domestication. The state of Nevada owns estray and feral horses. 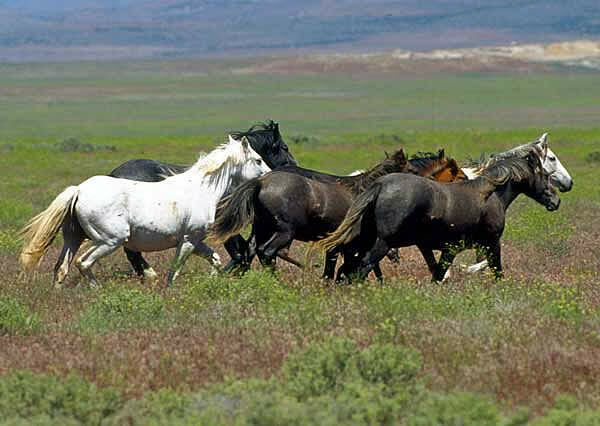 Wild horses and free-roaming Mustangs are protected by the BLM under the 1971 Wild Free Roaming Horses and Burros Act. Nevada authorities plan to sell the horses rounded up by the BLM at auction on July 10. The horses will be available to all buyers and are therefore at risk of ending up at slaughterhouses in Mexico or Canada. May 17, 2010 – CHICAGO, (EWA) – Equine Welfare Alliance and Animal Law Coalition applaud the grass roots efforts in 2010 that have resulted in a series of political defeats for those who want to bring horse slaughter back to the United States. Of course, commercial horse slaughter for human consumption remains illegal in the U.S. and no state law can change that. Nonetheless, proponents of the cruel practice have tried to use state legislatures to try to convince Americans to bring horse slaughter back to the U.S. In Missouri, for example, a bill, H.B. 1747, introduced by state Rep. James Viebrock, purported to allow the state to register and license and even provide inspections for horse slaughter facilities. There was even talk of building a horse slaughter plant in a small town in the state.